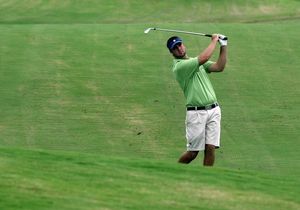 Chris Kennedy hits a shot during a recent West Florida Golf Tour event. Photo by Tiffany Tompkins-Condie/Bradenton Herald. Lakewood Ranch resident Chris Kennedy's red-hot form is still intact. The Cardinal Mooney alum, who is wrapping up an internship at Laurel Oak Country Club in Sarasota to complete his degree requirements at the University of North Florida, made it through the on-site qualifier on Monday at Innisbrook's famed Copperhead Course for a berth into the 105th Southern Amateur. The tournament kicks off Wednesday and several Manatee County players are in the field, including 2009 U.S. Amateur champ Ben An and University of Florida departing senior Bank Vongvanij. Kennedy qualified after firing a 1-over par 72. The two-time City of Sarasota Amateur champ said he's had trouble finishing rounds off in today's edition of the Bradenton Herald. But after a bogey on No. 10, Kennedy parred his way into the clubhouse and a spot into Wednesday's first round. To read more about Kennedy's super summer, check out today's Herald. Bradenton's Scott Lamb and Nick Torrance got shut out after both carded 2-over par 73s. That netted both a spot in a 5-for-3 playoff, as only seven spots were awarded from the qualifier.